Editor: This two-year old post by Rocky Neptun is a constant favorite or our readers. We thought we’d just bring it out for some more sun – but please realize dear reader, that it was written in November of 2010. Under the shadow of a venomous San Diego District Attorney and a cliff-hanger Attorney General election between a fanatical DA from Los Angeles and a sympathetic DA from the Bay Area, medical marijuana patients, providers and activists met near Mission Bay under the banner of putting patients first. The November 13th all-day gathering at the Marina Village Conference Center reflected both the radiance of altruism in the medical marijuana movement, its ancient heritage, and the potential to humanize the medical-care-giving industry, as well as the dangers members and patients face from reactionary forces still fighting the obsolete cultural wars of the 1960’s. About 50 persons turned out to participate in San Diego’s first symposium on “Training for Medical Marijuana Professionals” sponsored by Americans for Safe Access. The core curriculum, almost half the day, was centered on introductory preparation for those working with medical marijuana patients. The emphasis was on treating the whole patient with a greater understanding of how illness is not just an isolated condition but how physical, psychological and emotional factors interact to affect patients’ functioning. Dr. Amanda Reiman, Chairwoman of the Medical Cannabis Commission for the city of Berkeley and a lecturer at UC Berkeley, led the training session. Don Duncan, co-founder of Americans for Safe Access (along with San Diego’s own Steph Sherer), gave an hour-long history of the movement in California and reported on present efforts in Sacramento to guarantee and expand patients’ rights. Going way beyond the scheduled departure time, a panel of attorneys gave an overview of current law and recent court decisions, sharing knowledge about what is legal and what is not for both patients and care givers, including cooperatives and collectives. Led by Lauren Payne, Americans for Safe Access’ Legal Services Coordinator, the lawyers conducted “know your rights” training sessions on encounters with law enforcement officials. As I sat there, looking out the window at the bobbing sailboats moored near the conference center, I thought back to my days as a VISTA volunteer in the Appalachian Mountains. The Voting Rights Act had been passed; yet the black folks we were assisting in Skunk Hollow, near Corbin, Kentucky, lacked safe access to the polls. Roaming gangs of armed “redneck” mountain men threatened any who exercised their “right” to vote. How so like San Diego District Attorney Bonnie Dumanis whose ideological zeal and personal ambition threatens another group of people struggling for access to their rights. In this case, their entitlement to medical marijuana as guaranteed by the citizens of California. An attorney from Los Angeles, urged the participants to continue the struggle for their rights. He noted that eleven states and the District of Columbia have medical marijuana provisions and another nine states are in the process of working through those rights. Medical Marijuana deterrence is not a new phenomenon. Whenever those in power, religious or secular, have sought to increase or maintain that dominance, one of their first acts is to prohibit knowledge (just ask the Chinese government and Google). For thousands of years, the elderly women, usually widows, without a bread-winning male, made their way as the village healer. There were no doctors for the common people. They passed the knowledge of natural healing, the herbs and grasses of the forests, down from mother to daughter, aunt to niece. When I lived in a small Toltec village in the state of Morelos, Mexico as part of a cross-cultural educational experience in the early 1970’s, there was no doctor around. When I developed an eye malady, the family I was staying with presented me to a wrinkled, ancient woman – the village’s healer – who fanned the smoke of marijuana into my eye and also used a tincture from the plant to cure the infection. It wasn’t until the 14th and 15th centuries in Europe, when a series of devastating plagues broke out that the Church lashed out against naturalist healers in general and women in particular. From the Pope down to the lowliest friar, the official spin on the plagues was theological rather than medical; it was God’s vengeance for sin and only more devotion, more donations to the Church, would save you. Fearful mothers and fathers brought their ill children to the old women of the community, not the wine sodden priest. Some were saved; word and hope spread. The absolutism of the Catholic Church was threatened. The inquisition was formed to root out these “witches” and prohibit reliance on “medicine” in favor of prayer and confession. One of the charges brought against St. Joan of Arc was that she used marijuana. 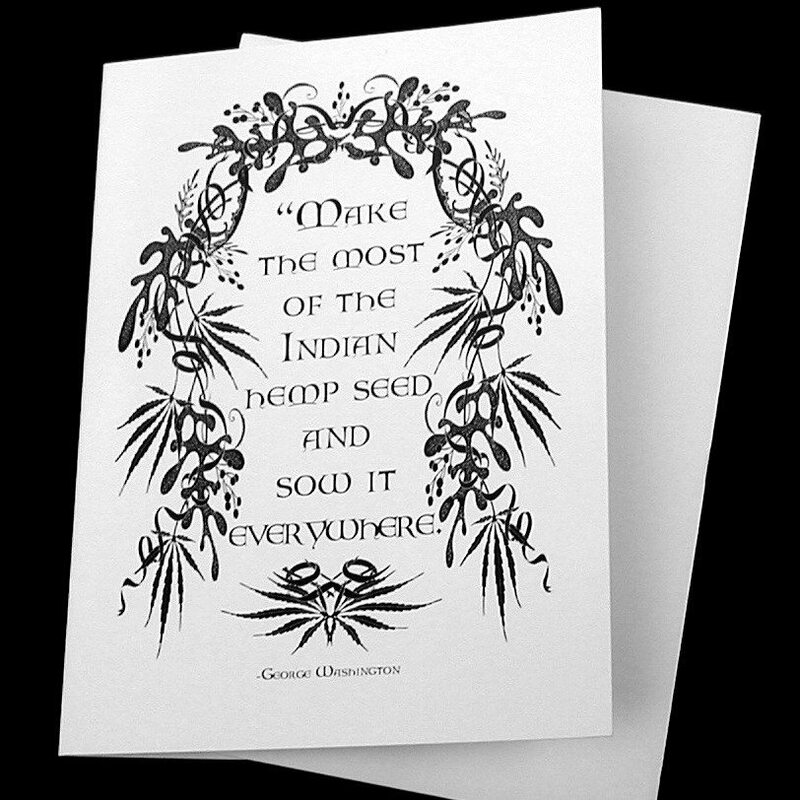 Not only was the giving of medicinal preparations, including cannabis, by herbalists and chemists declared illegal but merely possessing the expertise, called “witch’s knowledge” was punishable by burning at the stake. By 1484, marijuana had become so well known among the common people for treating the pain and suffering of the plague that a fearful Pope Innocent VIII specifically labeled it “an unholy sacrament of the second and third types of the Satanic mass.” Statements like this, flying in the face of reality, pushed more ordinary folk with their common sense further away from the church and laid the seeds of the Reformation. Did Jesus Use Marijuana? Would it Have Saved George Washington’s Life? I suspect that prostitution may not be the world’s oldest profession. [“I must have given a hundred thousand dollars worth of it away before I knew it was worth anything, my aunt used to say.”] I think the tribal healer became the first vocation. From the time we climbed out of the trees anyone could mate but those with the insight and knowledge to restore health and salvage lives were the indispensable ones. From the priests of Shintoism in Japan who used marijuana to unite couples in marriage and drive away evil spirits to the earliest Jews who “as part of their holy Friday night services in the Temple of Solomon, 60-80,000 men ritually passed around and inhaled 20,000 incense burners filled with kanabosom (cannabis), before returning home for the largest meal of the week,” as recorded by Jack Herer in his book, The Sociology Of Cannabis And World History. The Jewish Essene communities, south of Jerusalem, where Jesus is thought to have studied in his youth, are known to have used marijuana as a medicine. But from independent, self-governing, communal associations, the Christian faith, seized by popes and emperors, became a process of tyranny and oppression. Not only medical marijuana, but an entire cornucopia of healing herbs and substances, tragically, criminally, were systematically denied whole generations of ill people. Well into the 18th Century, bleeding patients of pints of blood was the primary treatment used by doctors. George Washington, who woke up one morning with the flu, was literally bled to death by his doctors. One wonders if he had just smoked some hearty Dutch Passion Feminized Cannabis and gone back to bed, would he have lived well into the 19th Century? Today’s bleeders would have us dependent on dangerous chemical manufactured by corporations who donate to their political campaigns. It is indeed ironic that Bonnie Dumanis, San Diego’s District Attorney and a member of the Log Cabin Republican Club, in her vicious pursuit of medical marijuana users, is at odds with Abraham Lincoln who refused to approve a proposed prohibition on the use of cannabis. Every American president until the 1930’s used medical marijuana and according to Morey Amsterdam and Eddie Gordon, close friends of John F. Kennedy, who used cannabis for his back pain, he was going to legalize it during his second term. Even though California voters approved the Compassionate Use Act in 1996, patients and providers have been under attack by reactionary forces and their contempt for voters and police state mentality right up to our present day. As San Diego attorney Lance Rogers pointed out to participants, from the July 2008 joint local and federal narcotics task force raid on the Amsterdam Collective (in opposition to President Obama’s promises to leave patients alone) through the clearly illegal entrapment and forgeries of the SDPD in its Operation Green RX busts in 2009 to October of this year when a North Park medical marijuana collective was harassed patients continue to have their rights assaulted. As I sat in the conference room, I realized the participants, some professionals, some poor, young and oldies, always looking over their shoulder, aware of their vulnerability and still putting the patients first, are living proof that heroism is alive and well. They are the ethical descendants of those poor women from the Dark Ages who were tortured and burned alive for saving a child’s life with their herbal medicine bag, the attendees are in the tradition of the old woman in the thatched hut who saved my eye so many years ago and they keep the possibility open that I will have help if I need to self-medicate in the future – if that good Cuban rum I smuggle into this country can no longer ease the pain of my osteoarthritis. There are those among us I call sufferers from “Pleasure Disapproval Syndrome.” A vast populace, unhappy with their lives, trapped in dead-end jobs, bored with corporate entertainment, happy-hour devotees and pharmaceutical addicts who are fearful not of criminals or terrorists…..they shiver in fear that somewhere, someone is having a good time, enjoying life. They voted against Prop. 19, are afraid that lesbians and gays might find enjoyment in marriage and, God forbid, are terrified that a person might actually get pleasure from taking their medicine. The culture war continues; however, the participants at the San Diego patient rights conference seemed to agree to keep their powder (ah, buds) dry and to continue struggling toward unhindered access to this ancient, safe, and effective medicine for all who need it. Rocky- splendid piece! I was surprised that the medical marijuana initiative passed recently in Arizona. Were you? Perhaps focusing on getting medical marijuana legislation passed in all 50 states would change the political discourse on the topic. Unfortunately, as you state in your post, marijuana collective members, patients and doctors would be exposed to reactionary forces in the interim. That cannot continue to happen. Locally we need to make sure that there is a viable candidate who is not going to wage war against the citizens on this issue to run against Dumanis. Do you have a sense who is interested in the DA position? I think this is the third time a medical marijuana proposition has passed in AZ. Maybe this one will stick. This is one of the most cogent, fact-filled articles I have ever read concerning the history and use of medical marijuana. Thank you! What an interesting, amusing and informative piece! Thanks, Rocky, for the enlightenment. I can’t think one group that is more welcome that those who would frequent this site. This is my first introduction to OB but won’t be my last. We have lost a voice for our traditional Canna-Community. Born in Ceres in 1961 I grew up knowing the Cannabis community of the Sierra foothils. So I have some reading to do here but I started a neutral site to gather all of us up and downs the state in hopes of a communal effort in drafting the Next Initiative for legalizing in California. We know the problems with medical Cannabis is that many are not medical. I am yet to open the doors to Google or any other bot and I hope we don’t need to in order to have a grass roots effort on Grass in California! Like everyone above, I really enjoyed this article, and learned a lot. I had no idea the demonization of marijuana ran so far back in history, and all up in the church. And you’re darn right about marijuana being “a wound healer, muscle relaxant, tonic for pain, fever easier and helped with childbirths.” It’s also a safer alternative as a social mood alterer than alcohol. Marijuana is effective for a variety of uses, and it grows like a weed — two likely reasons why it’s the world’s most controversial crop. Thank you so much for attending and covering our event this weekend Rocky. This article was absolutely amazing and very thorough. On behalf of Americans for Safe Access, thank you for helping bring a light to this issue. I hope that this type of coverage and the continued struggle of patients and activist will help bring the Dumanis reign of terror to an end so that the will of California voters can be respected, implemented, and not trampled on. It was a pleasure and honor to have be part of the training. Great piece, Rocky! I’d send it to my doctor – if I had one. I love history like this, so thanks for your contributions here. 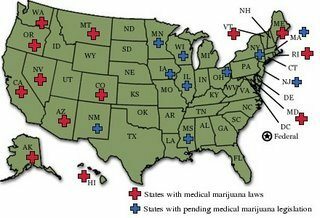 BTW, I don’t have an answer if you noticed the discrepancy between the number of states that have MJ medical laws in the text with that of the map. The map came from a different source and did not accompany Rocky’s piece initially. Older Article: Local guy refuses airport scan – his story has gone viral.